Instant Pot Turkey Chili Dogs - Recipe! - Live. Love. Laugh. Food. I was born in the South Bay of Los Angeles, but raised in Anaheim and many people think I am an Angel fan, but no I have always been a Dodger fan. Some of my Anaheim friends don’t understand why I have such an affinity to the Dodgers because I spent so many years in Orange County, but it’s because my dad used to take us to Dodger games as a child, and from then on – Dodger Blue has been in my blood. Hot Dogs are a sporty food and for me, I associate them with baseball games at Dodger stadium. Farmer John was always in the back of my mind as we headed in the car to the game and I couldn’t wait to spread a little mustard on top of those steamy dogs fresh from the foil wrapper. At the games, my brother and sister were always there having a similar experience and my brother carried his glove in hopes of catching a baseball from down the right field line. One afternoon, my brother got lucky and Dave Winfield from the San Diego Padres (yes, I’m dating myself) threw my brother his baseball and he was thrilled….what a great day. Since then, hot dogs are mainly a baseball food in my house and with the Instant Pot it has made them even better. 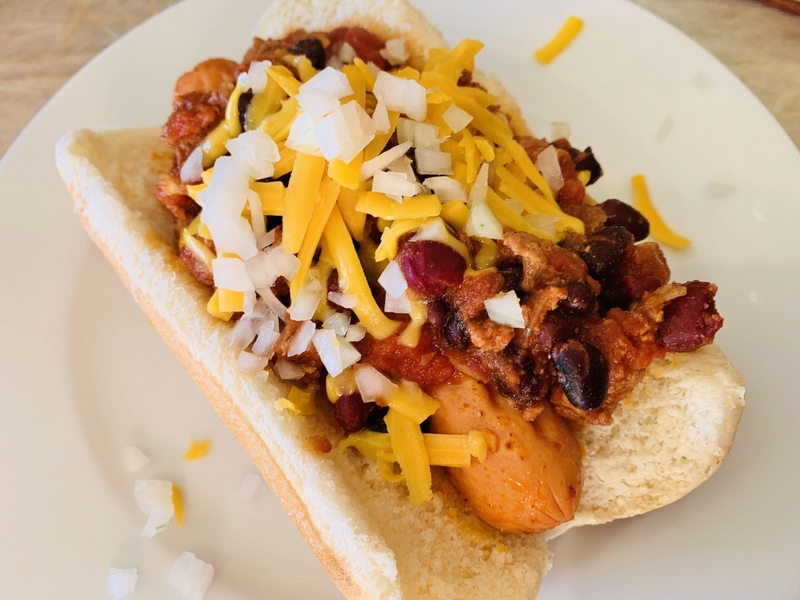 Making chili in an electric pressure cooker is deliciously easy and adding hot dogs to the top for a quick and efficient steam makes them plump and juicy with no drying out. I love the fact that the dogs and the chili are made in the same vessel – it lends itself to easy clean up. 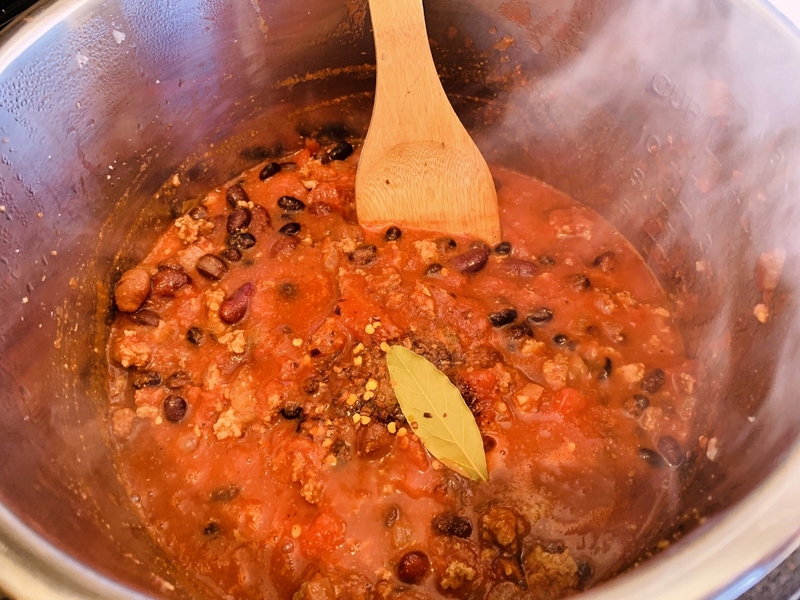 I think this recipe is perfect for the weekends whether you are a sports fan or not, you can make the chili first and let it remain hot in the Instant Pot, while you do your day and then pop the dogs in 5 minutes before serving time. 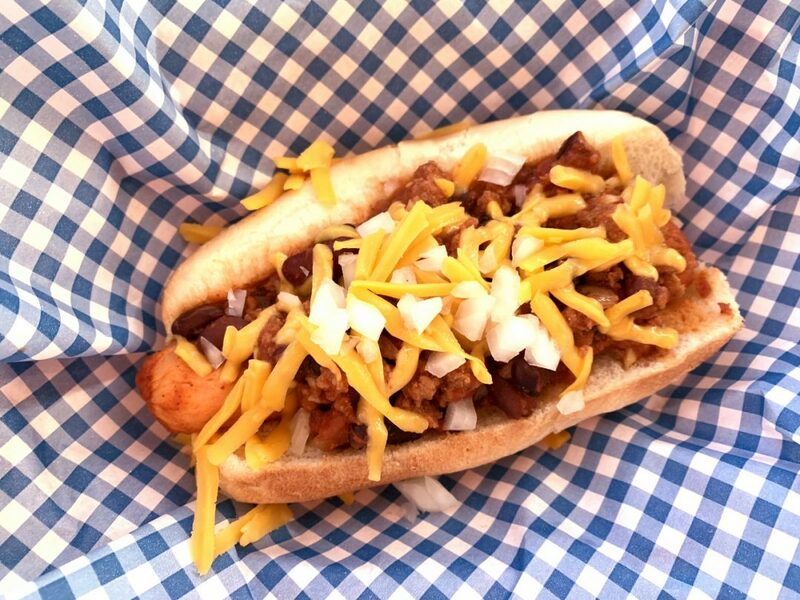 Don’t forget the cheddar cheese and onions to top them off – Go Dodgers! 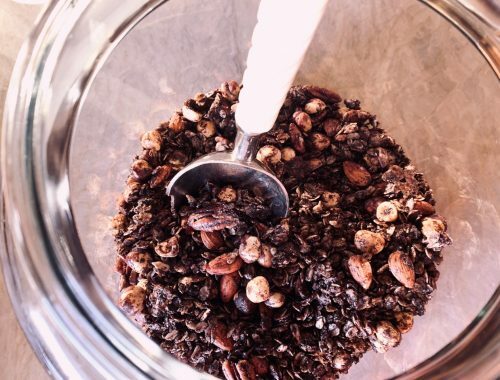 In an Instant Pot or electric pressure cooker, press Saute and add 1 tablespoon vegetable oil. Add onions, garlic and ground turkey and stir. Cook for 4 minutes while continuing to stir. Add chili powder, cumin, onion powder, salt and pepper, stir. Continue to cook for 1 minute. 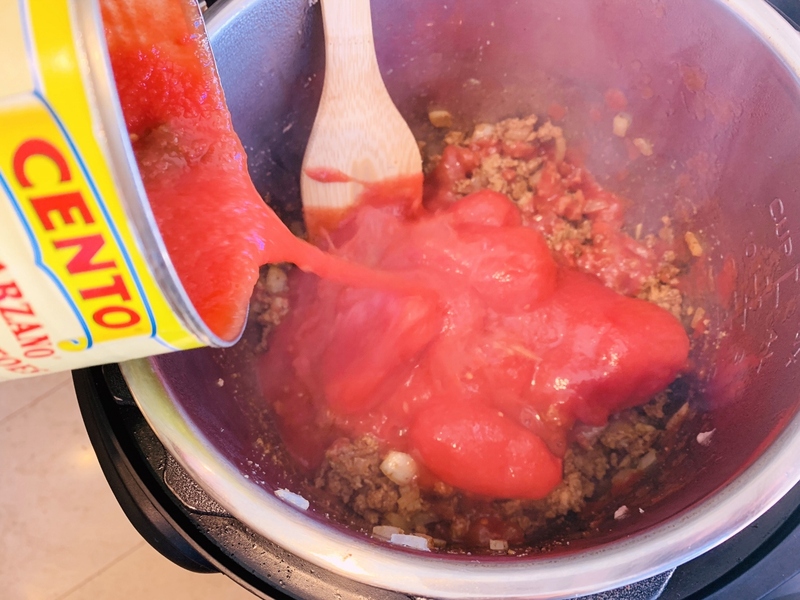 Add whole tomatoes and paste and stir, while breaking tomatoes apart with spoon. Add beans and stir to combine. Add chili flake and bay leaf. Press Cancel and place lid on pot. Press Chili or Manual and set for 10 minutes on high pressure. Let pressure release on its own and leave chili in pot, until ready to add hot dogs. Hit Cancel, add hot dogs and place lid on top and press Manual or Chili and set for 5 minutes on high pressure. 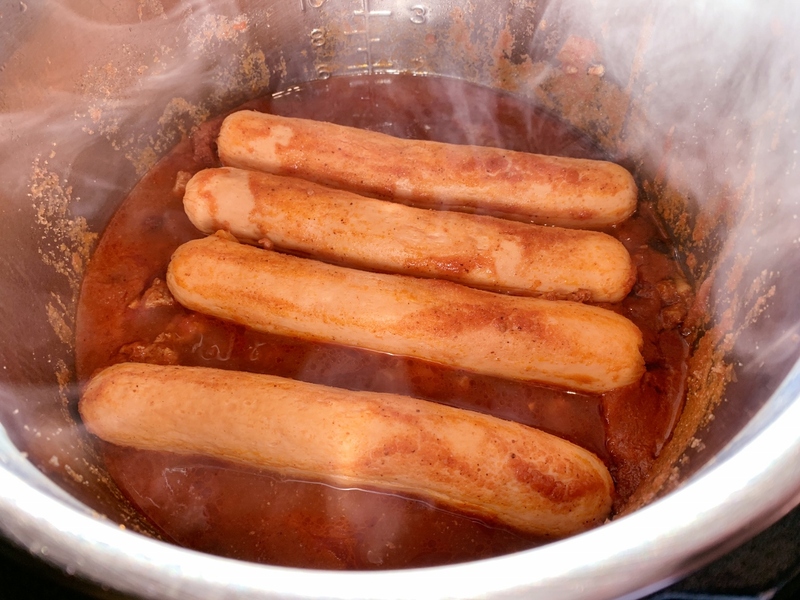 Place hot dogs in buns and ladle chili over the top. Sprinkle with cheese and onions, Enjoy! 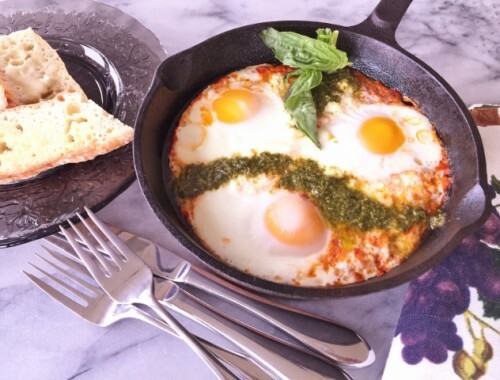 Italian Shakshuka – Recipe! 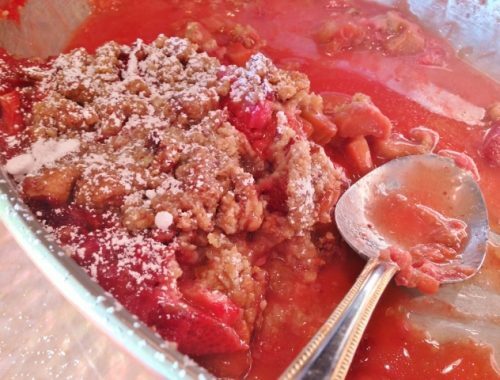 Great for Brunch or Dinner!